During a recent interview with a Hong Kong movie site, Chinese movie legend Chow Yun-Fat said he plans to donate most of his money to charity. "The money's not mine. I'm only keeping it safe for the time being," Chow told Jayne Stars in an interview published on October 10. One of the best-known Hong Kong movie actors, Chow has portrayed many classic characters on screen in dramatic films such as 1980s hits A Better Tomorrow, The Killer and Hard Boiled. However, while he has enjoyed a very successful movie career, Chow does not spend his money on material comfort. According to Hong Kong media, Chow leads a simple and ordinary life, spending only HK$800 ($100) each month. Reactions to the interview were varied. "Can anyone show me how to live on only HK$800 a month?" netizen Zhengzhiqielanggou posted in the comment section of the news article. "I think he means pocket money, it can't be living expenses," Ddiao_J commented. While some doubted Chow's spending claims, some netizens dedicated themselves to explain the star's mystery budget. "Don't forget he is a superstar, many of his living goods are free! A lot of brands offer free goods to make him into a brand ambassador!" While other stars are often photographed driving luxury cars or shopping in big-name brand stores, Chow is often seen taking public transport and using an old fashioned cell phone. According to the interview, he only started using a smartphone after his old phone, a first-generation Nokia, broken after 17 years of use. He is also frugal when it comes to what he wears. 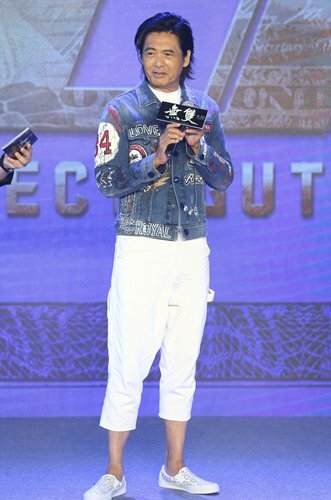 Compared to some stars who compete with each other when it comes to showing off the latest luxury clothing, Chow does most of his shopping in discount stores. Holding an indifferent attitude when it comes to what others think of his taste, Chow told Jayne Stars, "I don't wear clothes for other people. As long as I think it's comfortable, then it's good enough for me." So where does the star's money go if he isn't spending it on luxury items? Well, apparently a large portion goes to others. Several years ago, Chow and his wife, Jasmine Tan, established their own charity. In 2013, the couple disclosed their total net worth - $714 million at the time - and announced their decision to donate a large part of this to a variety of charities after Chow passes away. Many netizens found Chow's story touching, while quite a few compared the star's frugal behavior to Fan Bingbing, the famous Chinese actress who was recently caught up in a tax evasion scandal. "This is what a real superstar should be," Chinese netizen Kuxuankuangbade noted on Sina Weibo. "Compared to someone who finds all sorts of ways to avoid paying taxes, he is a real idol!" Xiaoyixiaobainianshaoxyxbns wrote.